If you learn to sculpt in ceramic modeling clay (firing pottery clay) you may enjoy it and never look back. That's what happened to me, after having been very keen on plasteline oil based clays for many years. In this online guide, I try to help you through your choice of raw materials. Your final preference should ideally be an informed choice and that's what this page is all about. The choice is mainly between ceramic clay (pottery clay), polymer clays and oil based clay (plastiline - sometimes spelled plasteline - not to be confused with 'plasticine' which is a patented modeling clay based on flour, salt and water registered by The Harbutt Company of Bath, England in 1900). All of the above mediums are used professionally by an array of artists. There is no right or wrong, just one person's preference, which is often informed by what they know, or have come to learn. When I changed to firing clays it was somewhat forced on me because it was what my clients in the Staffordshire and Worcestershire potteries were used to and their traditions and techniques required. Sculpting with ceramic firing clays was a real leap into the dark for me and so different to plasteline I can't begin to tell you. But... here's the thing about leaps in the dark. Sometimes, just sometimes, you land on your feet, unscathed in a better place than you were before. Now, having the knowledge of both types of clay, my first choice would always be ceramic modeling clays - as long as you have the right one. 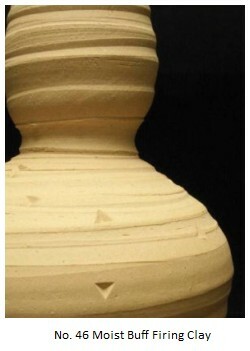 Ceramic clays are also known as pottery/firing/water-based clay. The techniques for working with ceramic clay I cover on a separate pottery clay page - this page is about different types of ceramic clay to buy and their properties. The first point to make is that even the best quality ceramic modelling clay is less expensive pound for pound than the synthesised brand based clays (polymer, plasteline or plasticine). Postage/weight is the same. Below I have compiled a list of the best ceramic modeling clays (pottery clay) I have found on the market to date. The clay I use professionally (Poyclays 1150) is not readily available in the USA, so I have developed a trial pack of 2kg, so it can be easily sent by airmail. Based in the UK, the clay I personally use is Potclays 1150 - an English firing clay for sculpting & modeling which has taken about 250 years to perfect in the Staffordshire potteries. This is the ‘secret weapon’ of all top ceramic professional modellers in the UK who work for clients producing fine china figures. 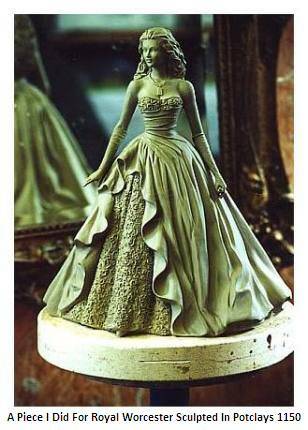 It can be moulded and also fired. The secret of 1150 is that it’s highly plastic and doesn’t dry out very quickly – it stays moist for a long time. 1150 is basically a stoneware clay (with some secret additions) and can be fired from 1100 to 1280. You can therefore use earthenware glazes as well as stoneware glazes. 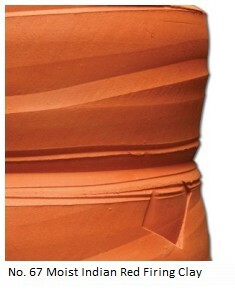 1150 has a high ‘ball clay’ content which makes it very plastic and flexible - the ideal for modeling. 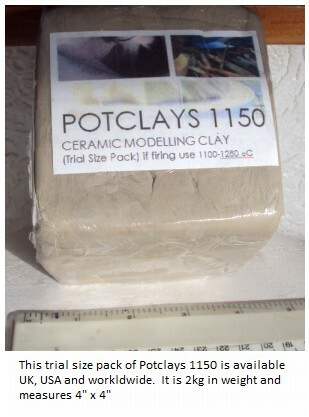 You can buy this clay from the Potclays website if you can take the minimum quantities of 12.5kg (a big heavy bagful). Postage is not too bad to the UK, but just mad to the US and worldwide. So, due to demand for a smaller quantity (which Potclays don't do), I have developed a trial size of about 2kg which can be sent airmail worldwide for under £30 postage. That's doable. The 1150 clay block measures about 4" x 4" square. and we'll talk in person via email. Although my finished pieces are in porcelain, I don't actually model with porcelain clay. Porcelain is too difficult for my type of work and I can't get the lifelike look I need in a sculpture. Don't forget, my sculptures are mainly for commercial companies and my own company, and the technique is to make a cast of my original master, not to actually fire it. However, if you are going to be firing what you model and want to have a porcelain piece, that's fine, you can use a porcelain clay. You will find it will have a good plasticity, but will dry out very quickly, especially on fine areas like hands or thinner ridges. What is the US equivalent to Potclays 1150? I set out to research the US equivalent modeling clays, but I have never tried any American clays myself. I have, therefore relied on other sources - namely Amaco (The American Art Clay Company) and professional sculpting colleagues in America. The truth of the matter is each clay has to be tested and compared first hand to get a real verdict, so the findings below are a guideline only. The infomation set out below, however, is on good authority from those sources. I will get around to testing the American clays, but I need to have a slight pause in my fairly heavy work schedule first. The thing is for me, the work I do has a low tolerance for error and the wrong clay would make what I do impossible. So I need to use 1150 for professional work. Period. It is tried and tested and I can't afford for anything to wrong wrong as my stuff is high spec. You need to test all the following clays against Potcays 1150 yourself. Amaco is the US equivalent of leading UK firm Potclays. Amaco have great tradition with excellent customer service and a very professional health and safety policy. That's not a plug and I am not an affiliate of theirs, neither am I of Potclays. Amaco No. 20 Moist White Versa Clay , which is a bit more expensive, but might be my own preference because of the greater plasticity. 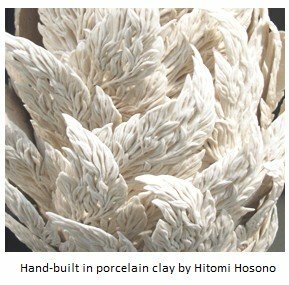 As it can be used for intricate flower making, without the edges cracking, my only concern with this clay, and I would have to check it out properly to tell you categorically, would be that, rather like porcelain, it might dry out rather too quickly, especially at the fine edges, like fingers and noses. But Amaco and my colleagues say it is great for detailing and particularly versatile for fine modelling and sculpting of the human form, so I must trust what they say. They say it can be worked and re-worked over and over longer than most other clays. The other thing I would need to test with this clay is that is can be worked with good resistance yet workable when it goes slightly harder. 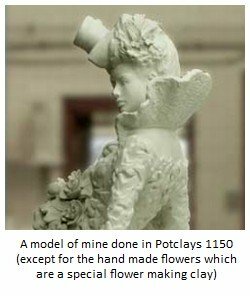 For example, in England I couldn't work with flower makers clay to make a sculpture. So I would need to test this clay against Amaco Buff 46, which is the other sculpting clay recommended by Amaco. Press moulding is another use for moist white versa, which is good if you have a repeated area of detail to apply. Amaco’s Buff Firing Clay No. 46 - This is reported as a good modeling clay but at a more reasonable price with slightly less plasticity. It can be used for human sculpture and hand work on things like ornamental decorative ware, as well as the usual throwing and normal pottery applications. This clay sounds quite like Potclays 1150 and sometime soon I will get hold of some of this clay against 20 Moist White Versa. Meantime, please test them yourselves and report back on my FAQ's page where we can talk. Then there is the Amaco No. 67 Moist Indian Red Firing Clay - a lovely colour, it is apparently particularly useful because it will not slump and warp at low temperatures like other red clays. I like the sound of 67-M modeling clay for certain rougher finish and more 'folksy' sculpts - I use the Potclays equivalent for certain sculpts with a rougher finish. These terracotta red clays are great when fired and very robust and forgiving - a great place to start if you are a total newbie. Bare in mind they fire to different colours if fired at different temperatures. It is red at bisque at lower temperatures and goes a red/brown at higher temperatures. 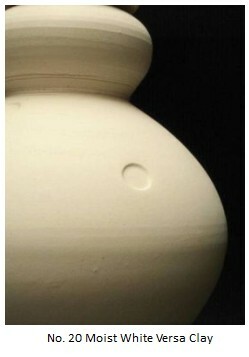 If you decide to work with any of the ceramic clays mentioned above, please bear in mind the health and safely aspects. Ceramic modeling clay in the moist or slip form is considered non-toxic. Dust is the area to look our for as silica and ceramic modeling clay dry air particles have been linked to possible health issues. But these issues only occur through long term respiratory exposure to the dry dust associated with clay or slip. Always keep in mind to finish the work while the clay is still wet. Finish with a wet sponge instead of sanding down dry. Similarly, any dust producing techniques should be avoided if at all possible, and if they can't, wear an approved mask.